On the heels of the success of Bike To Work Day, the formation of the Providence Bicycle Coalition, and the recent news about Providence’s initiative to add bike lanes and signage to the city, this is a perfect time to dream a little bigger. Last week I went to visit some friends in Northampton, MA, and I saw something that left me in awe. People biking while pulling trash. I asked my friend for clarification, and she said yes, they do infact, employ people on bicycles to haul household garbage and recycling each week. We do pickups all by bicycle, all year round, at competitive rates – without the loud trucks or diesel exhaust fumes. Since 2002, we’ve done 25,734 pickups and counting! Here they list 10 reasons to switch to their service. My next thought was, would something like this work in Providence? Although technically larger in land area, Northampton doesn’t exactly have the same population size or density as our little city. However, there are some neighborhoods in Providence where I think this could certainly work with the right arrangements. 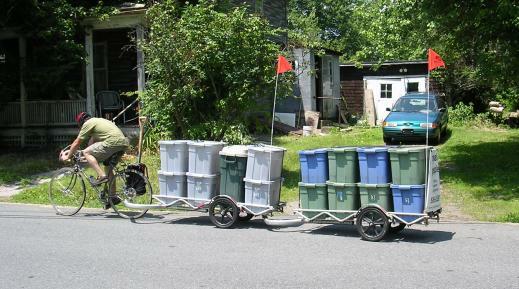 A group the size of Pedal People could handle the trash collection of a neighborhood the size of Elmhurst or Wayland Square. As the Pedal People point out, this gets more trucks off of the road, which in turn leads to less air pollution, less noise pollution, and longer lasting roads. It may even lead people to think twice before simply throwing something away; knowing a person is going to have to pull it behind them across town.